The Investment & Human Rights Project (IHR Project) was an initiative of the Laboratory for Advanced Research on the Global Economy (the Lab) at the LSE Centre for the Study of Human Rights. The Lab is directed by Dr. Margot Salomon, and has been established to probe the challenges posed by the complexities of the global economy and their implications for human well-being. The Lab creates a dynamic space for research, from the conceptual to the practical and across disciplines, on the myriad places where human rights, fairness and justice intersect with economic globalisation. The IHR Project was the first major initiative of the Lab and was active from 2013-2016. The Project was supported and sustained by grants from the Norwegian Ministry of Foreign Affairs and the UK Foreign and Commonwealth Office. The IHR Project was established to address the urgent need to consider what the normative developments over the last few years, including the UN Guiding Principles on Business and Human Rights (UNGPs), imply for the institutions, rules, policies and practices that facilitate, support and protect international investment. To address this need the IHR Project sought to build awareness on investment, human rights and their interactions; create constructive spaces for learning, research and the sharing of good practices; and build capacity among civil society, governments, international organisations and the private sector. During the three years of operation, the IHR Project became a focal point on investment and human rights and was an active contributor to international policy debates on the subject, including at the EU and UN levels. In particular, the IHR Project hosted policy discussions at a diversity of fora including the UN Forum on Business and Human Rights, supported the work of the Office of the High Commissioner for Human Rights and the UN Working Group on Business and Human Rights on investment-related issues, published a free on-line Guide for how States should integrate the UNGPs into their investment policymaking and conducted training on investment and human rights including to support the Colombian and Indonesian government to develop their National Action Plans on Business and Human Rights. Importantly, the IHR Project created this Learning Hub, the first of its kind on investment and human rights, as a dynamic, free, online learning tool with resources and information for a range of practitioners including lawyers, institutional investors, lenders, investment consultants and advisors, government and civil society. 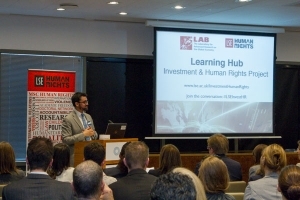 On 10 April 2014 the IHR Project launched the Investment & Human Rights Learning Hub. 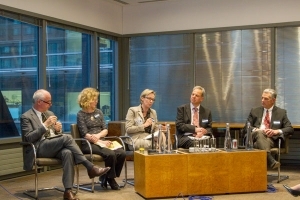 The launch event was hosted by the Herbert Smith Freehills (HSF) law firm, which welcomed over 100 professionals from industry, law firms, government and civil society to witness the unveiling of the Hub and to discuss the relevance of investment and human rights issues for their work. In his keynote address, Mark Hodge, Executive Director of the Global Business Initiative, pointed to two important roles for the Hub: to demystify international investment and human rights concepts, and to help address global governance gaps by pushing actors to look at new leverage points to ensure investment is carried out without infringing on people’s rights. A panel of highly experienced practitioners from industry, government and civil society then discussed the importance of investment and human rights for their practice and the need to build understanding in this area. Jonathan Bauer, the Program Manager for Human Rights for Hewlett Packard spoke about the company’s work on human rights risks within a range of investment activities the company undertakes such as mergers and acquisitions or designing strategies to enter new markets. Stéphane Brabant, partner and global head of the Africa practice and co-head of the mining group at HSF, spoke to the key role of lawyers, not yet widely recognised, in understanding, identifying and helping clients manage human rights risks in the context of investment projects. Helen Meekings, Head of the Environmental Advisory Unit of UK Export Finance spoke to the growing relevance of human rights to their investment support work, and she provided examples of cases where UK Export Finance worked to prevent and mitigate human rights impacts of investment projects they have supported. Lene Wendland from the Office of the UN High Commissioner for Human Rights emphasised the lack of knowledge and expertise among human rights experts of relevant investment issues and the contribution the Hub could have in addressing these gaps. Peter Frankental from Amnesty International UK highlighted the need to reconcile investor protection and the protection of and respect for human rights in international investment law, challenging the Hub and the Project to play an active role in facilitating work in this direction. 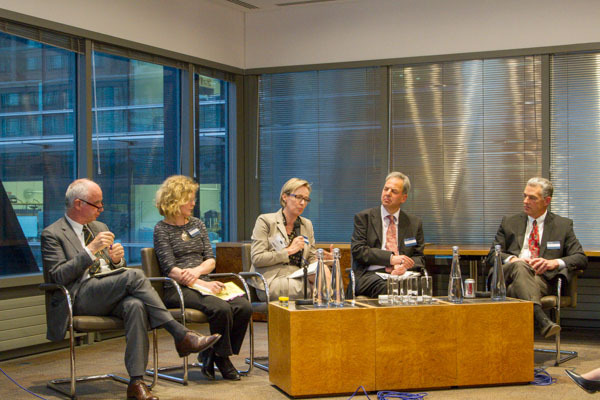 The event demonstrated the real-world need for the IHR Project and the Hub. As funding allows, the IHR Project and the Hub are looking forward to engaging with international policy developments, government representatives, commercial practitioners and civil society to foster understanding of investment and human rights issues and improve investment outcomes for all.